Initially, designers of the CMR considered standardizing all CMR metadata to a single, interoperable metadata format - ISO 19115. However, NASA decided to continue supporting multiple metadata standards in the CMR - in response to concerns expressed by the data provider community over the expense involved in converting existing metadata systems to systems capable of generating ISO 19115. In order to continue supporting multiple metadata standards, NASA designed a method to easily translate from one supported standard to another and constructed a model to support the process. 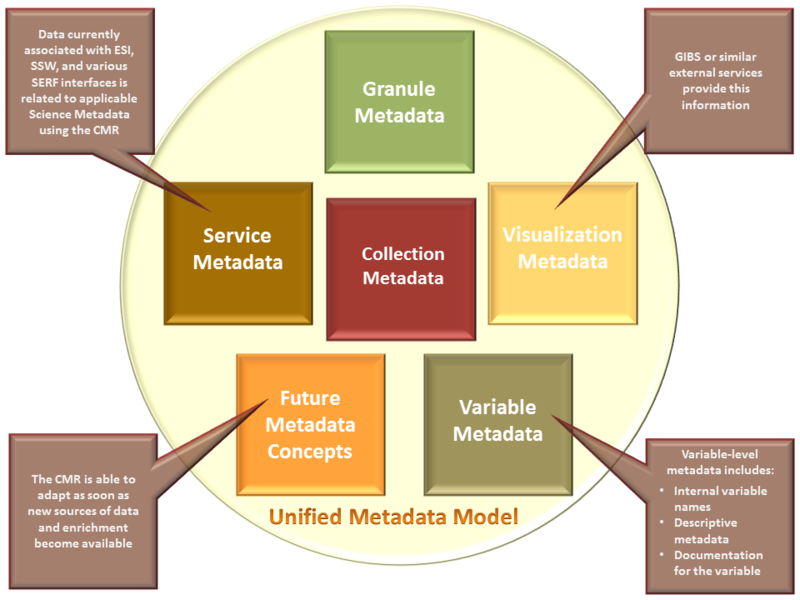 Thus, the Unified Metadata Model (UMM) for NASA's Earth Observation System Data and Information System (EOSDIS) metadata was born as part of the EOSDIS Metadata Architecture Studies (MAS I and II) conducted between 2012 and 2013. UMM is an extensible metadata model which provides a cross-walk for mapping between CMR-supported metadata standards. Rather than create mappings from each CMR-supported metadata standard to each other, each standard is mapped centrally to UMM, thus reducing the number of translations required from n x (n-1) to 2n. Note: n is the number of CMR-supported metadata standards. An example of mappings among collection metadata standards is depicted in the diagram to the right. Summary information about current UMM profile status and content is shown in the table below. Where present, the content diagram shows subject-related groupings of elements within the associated profile. Note: Table above represents the status of UMM profiles as of February 2016. For more recent and detailed information, visit the UMM Status Page. What Information is Contained in UMM Documentation? UMM documentation for each profile identifies required elements, constraints on those elements, optional elements, overall descriptions of the semantics of those elements, and guidance for how to develop and maintain high quality metadata. For each element defined in a UMM profile, there is an element specification, description, profile utilization, cardinality, analysis, specification of any conflicts that were identified by the unification process, a mapping to existing standards, examples, and future recommendations. An example of element documentation within the UMM-C profile is available for viewing. Approved UMM profile documents (highlighted green in the table above) can be accessed from the Key UMM Documents Page. As with any metadata representation, evolution and improvement are critical to the success of UMM. NASA’s UMM profiles are revisited and updated at least once per year. Part of this update process is a formal change proposal and review workflow. The EOSDIS community may contribute requests for updates, changes, clarifications, and deprecations of elements in a UMM profile, which are then tracked as part of NASA’s metadata quality effort. Requests for modifications are documented and an impact analysis is conducted. Recommendations along with their supporting documentation are then put before a UMM review board consisting of EOSDIS community members and the ESDIS Standards Office (ESO). After a review and commenting period, the UMM profile is updated to reflect approved changes and a new version is released. While it is understood that changes to a UMM profile can have an impact on existing systems and backward compatibility is highly valued, metadata quality is a critical aspect of UMM efforts and periodic updates are a way to ensure UMM is meeting end user needs and helping to drive EOSDIS metadata usage forward. To submit requests for updates, changes, clarifications, and/or deprecations of elements to UMM profiles, please send your request to Earthdata Support and it will be routed to the appropriate personnel.